The counter terrorism, role playing game that is Tom Clancy’s Rainbow six: Siege seems to be action-packed and addicting enough for any gamer’s standards, judging from the game’s preview in the E3 conference in 2014. There’s plenty of fun mayhem to inflict, along with a boatload of strategy, tactics and weapons that the player can employ within the game. (For what gamer doesn’t like the excuse to break stuff? And that too with the added bonus of it being a tactical advantage and necessity in the game. The game developers have already stated that they had focused on team work within the game (which is similar to the other games in the Tom Clancy’s Rainbow franchise of games), but added that they’ve tried even harder to give players more freedom within the game, arming the game’s environments and characters with high-tech AI (artificial intelligence) reactions that make the game as realistic as possible. The hostage’s reactions and importance in the game are especially eye-catching. For, “capturing” and “protecting” the hostage is one of the main priority’s of the game in its multiplayer mode. In addition to that though, in spite of all the nice new toys the game allows its players to play with and cause mayhem, each team has to be wary of harming the hostage. For, capturing the hostage alive, or keeping the hostage within their ranks and alive (depending on which team the player is in for that round), is a top priority of the multiplayer mode of the game. The main gameplay of Tom Clancy’s Rainbow Six: Siege revolves around the hostage. There are two teams in each round of the game – the attacking team and the defending team. The attacking team’s priority is to breach through the defending team’s base structure in order to capture the hostage within their ranks – and to capture the hostage alive. Whereas, the defending team’s top goal will be to reinforce their structure and lay traps for the attacking team in order to keep the hostage alive and safe within their ranks and away from the clutches of the attackers. This hostage, players should note, is a living breathing human being within the game. So if a stray bullet or attack hits the hostage, the hostage will die. And that round will automatically end with the team that caused the hostage’s death as the losers of the round. The hostage character, thanks to the AI (Artificial Intelligence) tech used in the game, will react to what is happening around him (or her) like a regular player character (or real life hostage) would. For instance, it would be quite normal for the hostage character to automatically shield against an attack or explosion or during gunfire. 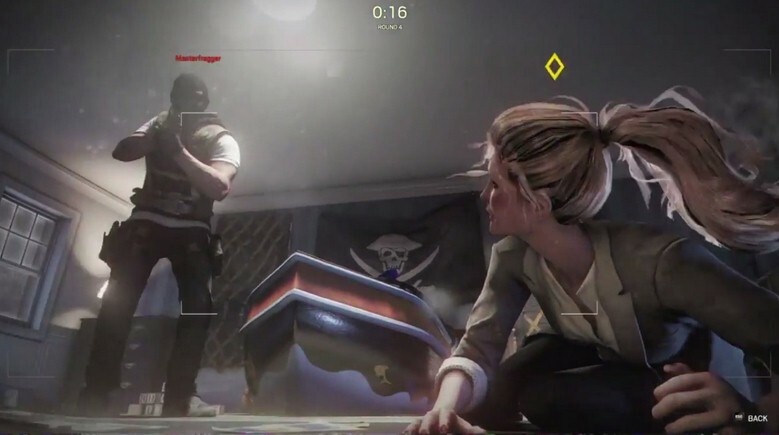 The hostage will even call out to the attacking team during an attack to reveal his or her location to them if a defending team’s member is not guarding them at the time. (And possibly vice versa as well.) Additionally, just like your unit’s team mates, the hostage can be revived when he or she is down. And also, because each hostage and situation will be different from the others in the game, the gamers will not be able use the same strategy more than once.